Food cravings can be powerful things. Now and then I get taken over by the desire for a particular type of food and nothing else is going to satisfy. Recently, my taste buds just wouldn’t let go of the need for a hot dog. I could have gone and just made one at home but I figured that I would combine fulfilling my craving with exploring the foodie scene in Los Angeles. Fritizi Dog has been on my radar for several months now but I hadn’t had the chance to try it. When I had been to the Farmer’s Market where it is located, I tend to get distracted by the shops at the nearby Grove shopping center. This time though, I made a point of going directly there after work with the sole purpose of grabbing a hot dog. Fritzi Dog’s menu is interesting. All sort of different possible combinations including hot dogs made out of different types of meat, a variety of buns and a plethora of toppings options. After a bit of deliberation, I decided that the garlic dog was the winner. The base is a beef and pork dog with a little bit of spice to it. The pretzel bun was a stronger selling point for me. I did find it interesting that instead of salt, the bun has sesame seeds on it. It did turn out to be a good idea though because the garlic aioli and crispy onions that go on top provided enough sodium. Doubly so asI had their tater tots as my side and they were generously salted. My craving was satisfied but I know that I am going to be need to go back to Fritzi Dog and try another flavor. I have my eye on the bird on a wire dog. A hot dog made of turkey and duck is far too tempting for a foodie explorer, don’t you think? 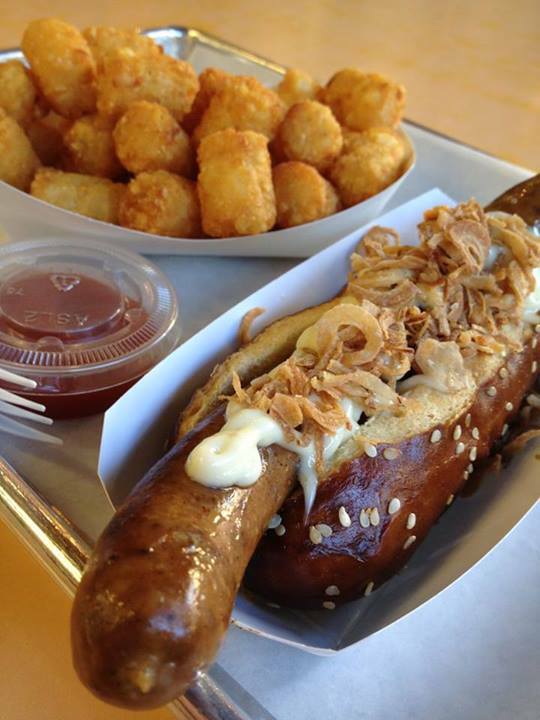 This entry was posted in Eating Out In Los Angeles and tagged hot dogs. Bookmark the permalink.